Trusted by pros, the flagship TRAKTOR KONTROL S4 is the all-in-one 4-channel DJ system. Now with the latest TRAKTOR features at your fingertips, take your mix to new heights. Hardware and software � fused in perfect harmony. The redesigned TRAKTOR KONTROL S4 is the first-class DJ system tailor-made for TRAKTOR to deliver an inspiring DJ experience. The S4 combines a premium 4 channel mixer, built-in 24 bit/96 kHz soundcard, an intuitive interface, and TRAKTOR PRO 2 software with Remix Decks. The ideal one-stop package for DJs who want pro features, instant usability and go-anywhere portability. Easy to use right out of the box, mix up to four software decks with intuitive deck control sections, essential Remix Decks buttons, high-res jog wheels with aircraft-grade aluminum plates, and two effect units deliver total control over your music. The S4 also features color-coded RGB buttons to trigger cue points, loops, and samples as well as dedicated Flux Mode buttons for each deck. TRAKTOR KONTROL S4 is ideal for travelling DJs, providing everything you need to rock a party. With its slim profile, it�s incredibly easy to transport from gig to gig. On-the-go set preparation has never been easier. 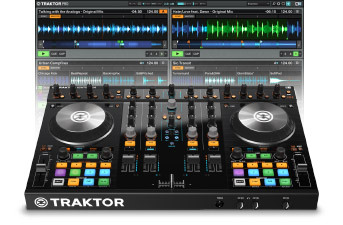 The S4�s included TRAKTOR PRO software even syncs with TRAKTOR DJ on your iOS device for effortless song management. TRAKTOR KONTROL S4 boasts an ergonomic, full featured 4-channel mixer control section with sturdy faders, CUE buttons, high-quality 3-band EQs, and a filter control knob on each channel. Whatever your flavor, the filter can switch between Traktor, Xone and other industry standard styles. Personalize your tracks by adding an electrifying layer to your mix. The intuitive Loop Recorder acts like a fifth deck by recording and looping audio on-the-fly. TRAKTOR KONTROL S4 also includes a powerful and versatile audio interface built to handle the most earth-shaking sound systems. Extensive and carefully placed connections let you connect turntables, CD players, instruments, MIDI gear and more � providing all you need to take your performance to new heights. Get straight into the mix with included TRAKTOR PRO 2 software. The latest version comes remix ready with innovate Remix Decks to blur the boundaries between DJing and live performance. Remix Decks can be triggered directly from the S4 hardware. Ready-made Remix Sets from top artists are available online for download � unleash your creativity into the mix. Turntablists and vinyl lovers can add scratch functionality to the S4 with the TRAKTOR Scratch Pro 2 Software and Timecode Kit add-on. TRAKTOR DJ SYSTEM REQUIREMENTS iPad version: iOS 6 or higher, iPad 2 or later, or iPad mini. 500 MB free storage/disk space recommended.